Ready to sell your novel device in the United States? In a system based on predicate devices and substantial equivalence, marketing an innovative or novel device comes with some unique challenges. What do you do when your innovative device has no predicate? 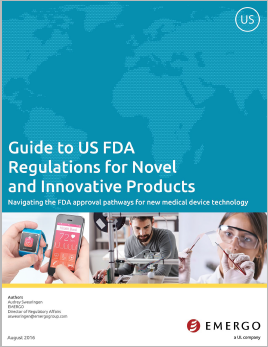 As the range of novel and innovative medical devices continues to grow, the challenge for both industry and the US FDA is to determine the best way to get these new devices to health care providers and patients as soon as possible, while ensuring safety and effectiveness. In this whitepaper, we discuss your options for bringing your novel device to the US market. What are the common regulatory pathways in the US? What to do if your device is truly novel? What is the de novo process? What is humanitarian device exemption (HDE)? What is the expedited access pathway (EAP)? Get answers to all of these questions and more in this white paper. Audrey Swearingen, RAC (US): Audrey Swearingen is Director of Regulatory Affairs at Emergo's Austin, Texas headquarters. With over 20 years of experience in regulatory affairs, Audrey's areas of expertise include US FDA medical device registration, as well as European and Canadian device registration.